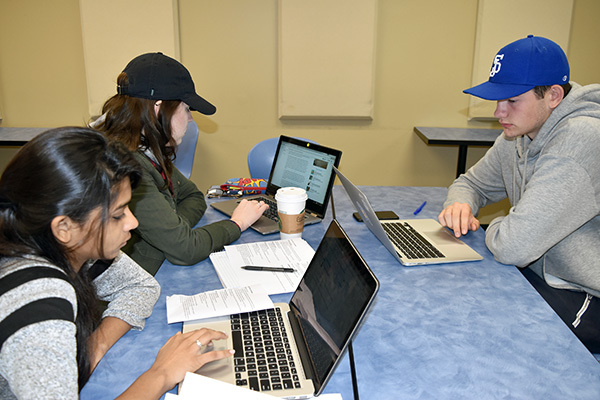 First-year students in Richard McNabb’s First-Year Writing (ENGL 1A) course work as a group to analyze an article and post comments in Canvas as part of an in-class discussion. 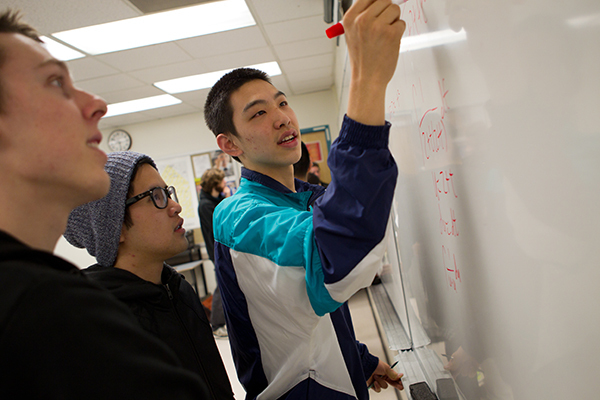 San Jose State faculty members are testing out ways to get students engaged in general education courses and to improve student success in key classes with a CSU Promising Practices grant that provides resources to redesign classes. Richard McNabb said he pursued the grant to increase student engagement in his First-Year Writing (ENGL 1A) courses, while Manolo Callahan said he wanted to find a way to present a dense amount of material in his two-semester Mexican Americans and the Development of U.S. History and Government (MAS 10A and 10B) course. The students will be engaged in multi-modal writing projects that will include text, visuals and audio. McNabb is also incorporating new technology into his classroom that supports more engagement with students. He and six other English professors are using a software application that allows them to ask a grammar-related question and get answers from all the students in the classroom at once. Using i>Clicker and Learning Catalytics, each student answers a multiple choice question from their cell phone or a laptop. In his class, McNabb can see what percentage of students select the correct answer and he can discuss a concept further if a high percentage of students select the wrong answer. “It allows me in real time to assess how engaged they are with the material,” he said. 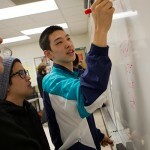 While students in one session of his class had only used the tool once, it received promising reviews. The students are also using Canvas, the campus learning management system, where they can access a Writer’s Help 2.0 handbook that is available campus wide. McNabb’s students were engaged with Canvas for a group activity on a recent morning. Gabryella Milano, ’19 Psychology, said she liked using Canvas during group work on analyzing articles because the students can put their comments directly into a class discussion online. “I like the direct feedback,” she said. Callahan, who teaches a two-semester course, increased his use of Canvas this year. Beginning in fall, he created weekly learning and specific reference modules in Canvas to present course material. The modules explain high-level concepts his students need throughout the semester such as critical reading techniques, concept mapping and research methods along with weekly content on the historic topics they are studying. For his class, the students log into Canvas to read their weekly assignments, watch video lectures or review clips from movies or films about Mexican history and culture. The students write short essays after reviewing the material and he encourages student interaction by requiring them to write comments on the essays of one or more peers in the class. Callahan meets once a week in a lab class, where students participate in active learning sessions. He said the flipped model allows him to spend in-person class time on monitoring and assessing the students’ understanding of key concepts and historical debates. As part of the grant, faculty members are invited to regular webinars with educators from other CSUs who are also working on course redesign.